The Service Award program was developed in 2010 to recognize MMTA members whose commitments to the Association go beyond the call of duty in promoting and fulfilling our mission: to provide our membership with the tools needed to meet the diverse challenges facing them by offering education, services, continuing professional development and ethical standards. We congratulate our two very deserving 2018 honorees: Marie Sherry and Andrea Boot. 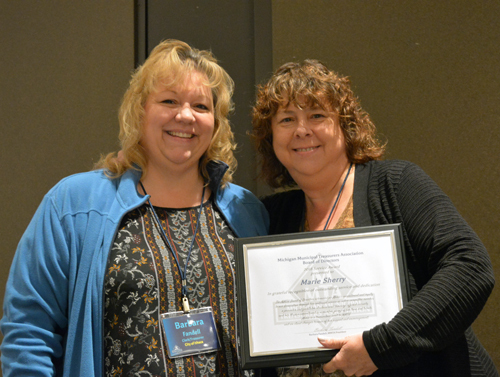 The MMTA Board of Directors acknowledges Marie’s commitment and loyalty to our Association through her continued service as active committee member, a presenter and facilitator at educational trainings offered annually, and her 16-year commitment as a member giving of her time and talents. Marie is a tremendous asset to MMTA and we stand stronger because of her support and encouragement. Pictured, President Barb Fandell and honoree Marie Sherry. The MMTA Board of Directors acknowledges Andrea’s commitment and loyalty to our Association through her service on the Legislative and Nominating Committees and her 18-year commitment as a member giving of her time and talents in her advocacy of MMTA. Andrea is a tremendous asset to the Association and we stand stronger because of her support and encouragement.